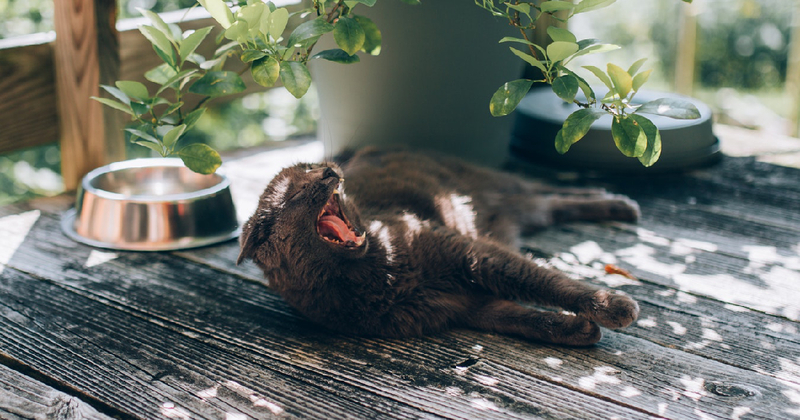 You don’t want your cats to grow old, but it is inevitable and it can be difficult to adjust to the changes in their habits. They will sleep more and play less and you will wonder if there is anything you can do to make their lives comfortable and keep them at optimal health. The answer lies in their diet. Everybody needs nutrients to survive and if your cats aren’t getting the right ones they won’t thrive. However, although their nutritional needs don’t change as they get older, the way they cope with food does. We are here to give you advice as to how to deal with these changes. Cats have to eat meat. They are natural carnivores and without meat in their diet they will become ill and possibly die. It is interesting to note that in the wild cats only eat meat. The nearest they get to eating plant based food is by catching an animal who has eaten grass or similar. This need for meat doesn’t change as your cats get older. They still need complete protein which includes meat, fish, and poultry. Even eggs are good for them. Fat is also important as it provides your cats with energy. 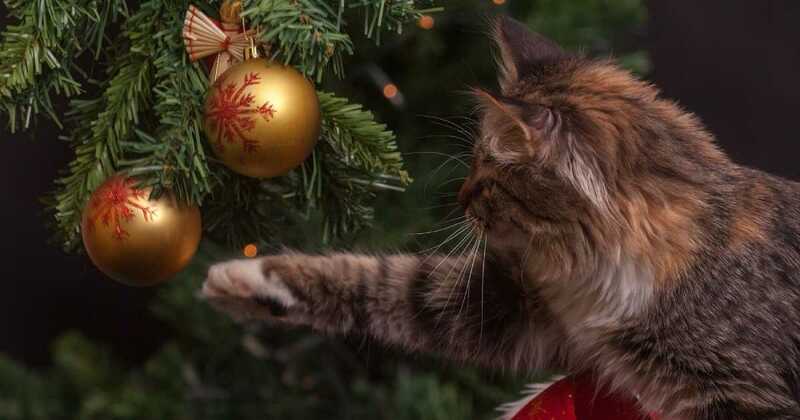 However, although their daily requirement of protein, fat, and carbohydrate remains the same, senior cats may not be able to digest them in the same way they did when they were younger. Because of this it is advisable to change to a senior cat formula which contains food which is more easily digestible. However, when choosing a cat food, make sure that the protein count is high. It is essential to their health and wellbeing. Unlike dogs who need less calories as they age, cats need the same amount when they get older. Strangely enough, their energy decreases in middle age, but then picks up around the age of eleven. This is why you often see overweight cats around the ages of seven – ten. However, as they pass middle age, the majority of cats have a tendency to lose weight even though they should be eating the same number of calories as they did when they were younger. As we have said, this could be due to problems with digesting the food, but there is another reason. Basically some older cats will refuse to eat the same amount as they did. Cats are finicky creatures and this increases with age. One day they wolf down one brand of cat food, but the next they have gone off it and you are left with wasted tins. If you can’t get your senior cats to eat enough, there are steps you can take. It is common for older cats to lose their sense of smell and taste. Try giving them smelly fish and see if they eat it. You can also warm their meal in a microwave as this increases the aroma of the food. An alternative is to add the water or oil from a can of tuna to their food. This will also increase the smell and taste and hopefully persuade them to eat. Canned food rather than dry is also a choice you should consider as it smells more than dry food does. Another benefit of canned food is that it is more calorie-dense than dry food. It is important that your cats are getting the right amount of calories. Another reason why your senior cats aren’t eating could be that they have dental problems. It is quite common for older cats to have bad teeth or even to have lost some. If they are used to eating dried food, try them on wet food instead. Stews are easy to eat and there’s lots of delicious gravy for them to lap up. However, if they won’t eat anything but dried food, try soaking the kibble in meat broth. This will be much easier for them to eat. In addition, it can be daunting for your cats to be presented with a big plate of food. A solution to this is to serve smaller meals more often during the day. By doing this they might be tempted to eat more and so their calorie count will increase. Finally, make sure that your senior cats have a chance to eat in a stress-free environment. Keep younger cats away as they might try and steal their food. Unfortunately, as cats age their risk for developing diseases increases. Of course visiting your vet is essential and he may prescribe medication for your cats. However, we can help with this by changing their diet. Special diets are designed to help lessen the effects of the disease and at best may even hold back the progression of the illness. Fiber is not usually a big part of the diet of healthy cats. However, if you have cats with diabetes mellitus, colitis, or constipation, added fiber could be helpful. Give cats with colitis, chronic kidney failure, or inflammatory bowel disease digestible sources of protein, fat and carbohydrates. Senior cat food is generally easier to digest or ask your vet for a food designed for the particular illness. If your cats have heart problems, reduce the amount of sodium in their diet and increase the level of taurine. Taurine is an amino acid which helps to metabolize fat. You will want to put as little pressure on the heart as possible. If cats have cancer they may have to have medical procedures such as surgery or chemotherapy. However you can help reduce the effects of the disease through their diet. The best thing to do is to increase the level of Omega-3 they are getting. This fatty acid is found in nuts and seeds so either check your senior cat food to see if it contains omega-3 , or ask your vet for a specialized food. Cats need to stay hydrated if they want to lead a healthy life. However, a lot of senior cats don’t get enough water. A solution to this is to put a few sources of water around their eating spot so that they have a choice. If this doesn’t work, try adding flavoring to the water. Perhaps put in a little water or oil from a can of tuna or sardines. This should attract them to the water and while they are lapping up the tuna oil they will also be getting their daily dose of water. Another thing that might worry you is if your senior cats are getting enough vitamins and minerals. If they are not digesting their food properly this could be a problem and you need to talk to your vet to see what supplements they need. Don’t buy over the counter medications as you may overdose your cats, especially if you use human supplements. Your vet will be able to supply you with the appropriate medications. So you decide to go out and buy senior cat food for your cats. This can be a little daunting as you will find lots of products out there and it can be difficult to decide which one to purchase. The first thing to do is look at the list of ingredients. The list is always organized in descending order by volume. This means that the top ingredient is the one which has the largest percentage of the food. You always want to make sure that this is a protein, not a byproduct or grain. The second thing to do is look at the next ingredients. Easily digestible carbohydrates, animal fats, and other proteins should be near the top of the list. If the list has a carbohydrate as the first ingredient, don’t buy it as it won’t give your cats the right nutrition. In addition, don’t buy the cat food if it has fillers like wheat, corn, or soy as they have very little nutritional value. If there are vitamins and minerals on the list, all the better, but if you don’t understand what the ingredients are don’t buy it. There could be lots of unnecessary fillers with very little protein. Another thing you can do when looking at the label on the cat food is to make sure that there is a statement from AAFCO saying the food meets their very high standards. AAFCO is the Association of American Food Control and they regulate the sale and distribution of food for animals. The final thing you should check for on the label is that they have stated the amount of crude protein in the food, as well as crude fat, crude fiber, and moisture. You don’t want the food to contain too much liquid otherwise your cats won’t be getting enough protein. Ideally, there should be at least 35% – 45% protein in the food, 5% fat, and just 3% fiber. Perhaps you aren’t sure where to go from here. There are a lot of products out there and maybe you don’t know what to choose. Here we will give you our top rated foods for senior cats. 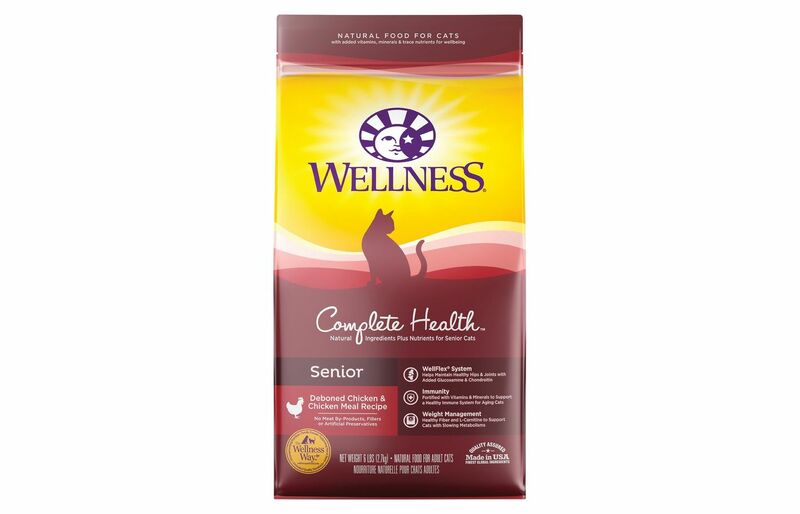 This is one of the best products out there and it will keep your senior cat healthy and lively. It is a dry cat food and has no artificial colors, flavors or preservatives. The main ingredient is chicken, which is a light protein and can easily be digested by your cats. The food is packed full of vitamins which have an antioxidant effect and will keep your cats young at heart. There are plenty of vitamins C and E in the food and this will ensure that the immune systems of your cats remain healthy. It also contains natural fiber which helps to reduce hairballs and keeps the digestive system working well. If you are worried that your cats might get an illness such as arthritis, cataracts, or heart problems, this is a great food to choose as it contains the right nutrients for eye, heart, kidney, and joint health. If you are interested in giving your cats a holistic diet, this is a great choice. 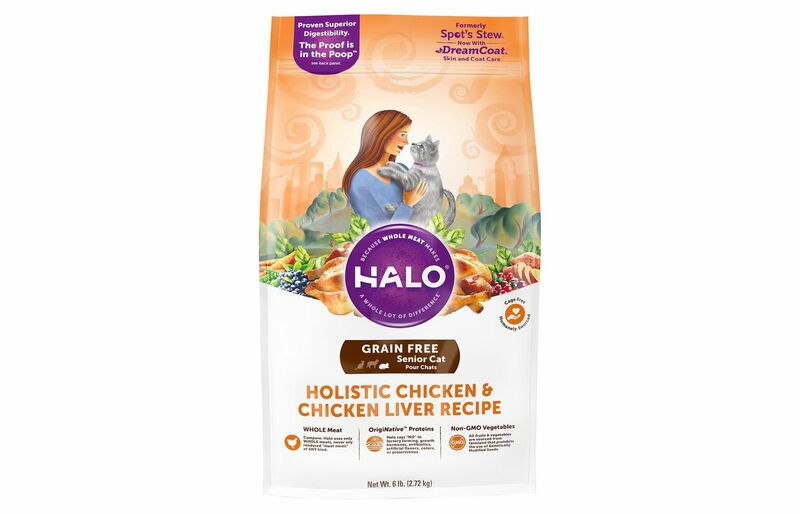 You will find that only the best cage free chickens are used in producing this wet food as well as non GMO fruits and vegetables. It is made with healthy chickpeas and greens such as dandelions and parsley. 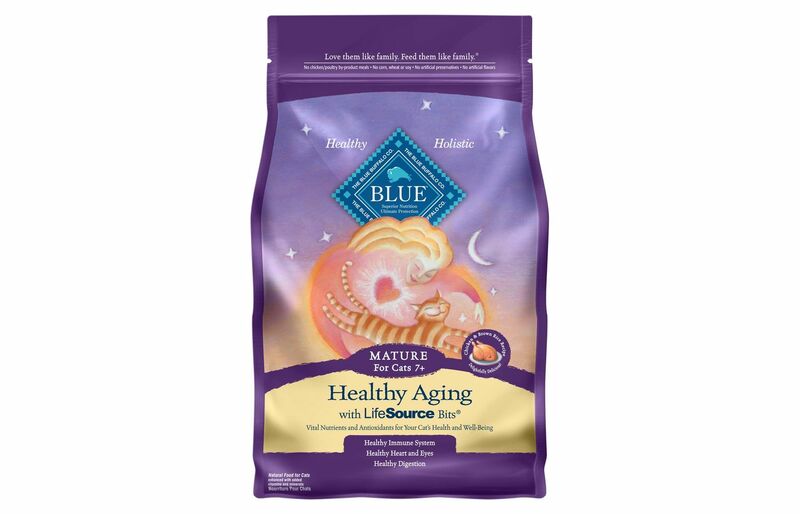 These provide valuable antioxidants which support the health and vitality of your cats. It is grain-free meaning that it is more easily digested by your cats. The smooth texture of this food means that it can help hydrate your cats which is important for their welfare. Although the protein count is not as high as in some senior cat foods, what there is is high quality. The chicken in this food is able to support lean body mass loss which often happens as your cats age. It also contains the essential fatty acids which are needed for a healthy coat and skin. This dry food is premium and is well worth investing in. It has a high quality protein count from deboned chicken and there are no fillers to reduce the nutrient levels. It is fortified with many vitamins, minerals, and antioxidants which help to support a healthy immune system. It also has taurine which is an amino acid important in the metabolism of fat. 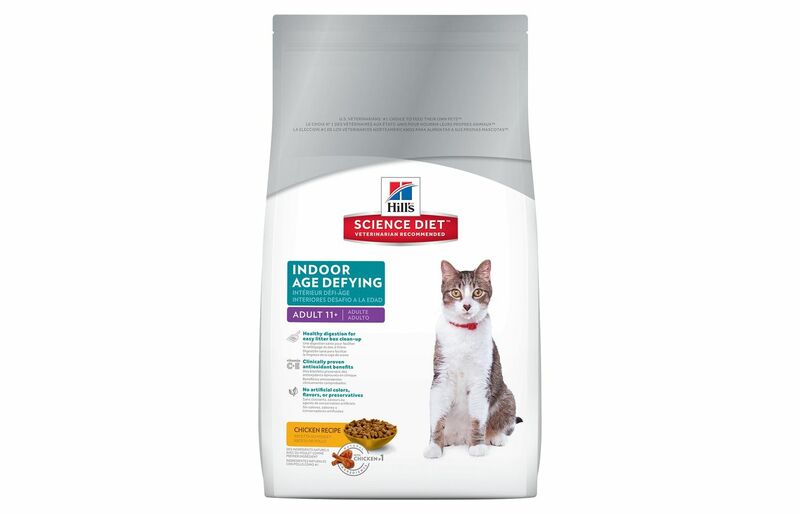 If your cats are having trouble digesting and their metabolism seems to be a little slow, this dry food is a good remedy. It has prebiotics, probiotics, fiber, and l-carnitine which all help to reduce these effects. There are no grains like wheat, corn, or soy which can have a detrimental effect on the health of your cats. It does, however, contain cranberries which help to prevent harmful bacteria from entering the urinary tracts of your cats. A shiny coat and healthy skin are the results of the omega fatty acids in this cat food. Our cats deserve to have treats every now and then to show them how much we love them. In choosing a treat you want to find something that is both healthy and delicious for your senior cats. 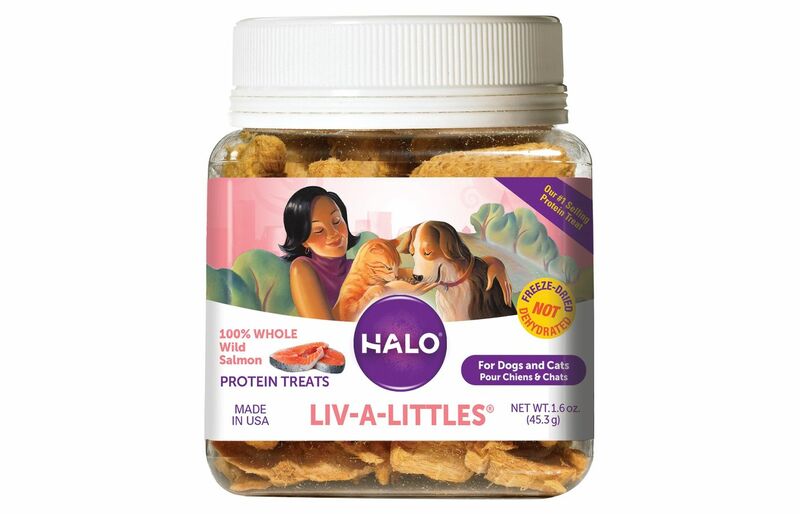 Well, you won’t go far wrong choosing Halo Liv-A-Littles wild salmon treats. The only ingredient in these treats is salmon. You won’t find empty fillers or grains such as wheat or corn. The treats are freeze-dried, which is much better than using a dehydration process. When the treats are freeze-dried, all the wild salmon nutrition, aroma, and taste are kept firmly in them, unlike dehydration which can lose up to 50% of the nutrients. The vitamins and minerals, as well as the natural enzymes remain in the treats which has a beneficial effect on the health of your cats. They are perfect as a daily treat for your cats and may encourage them to eat if they have been reluctant to do so. 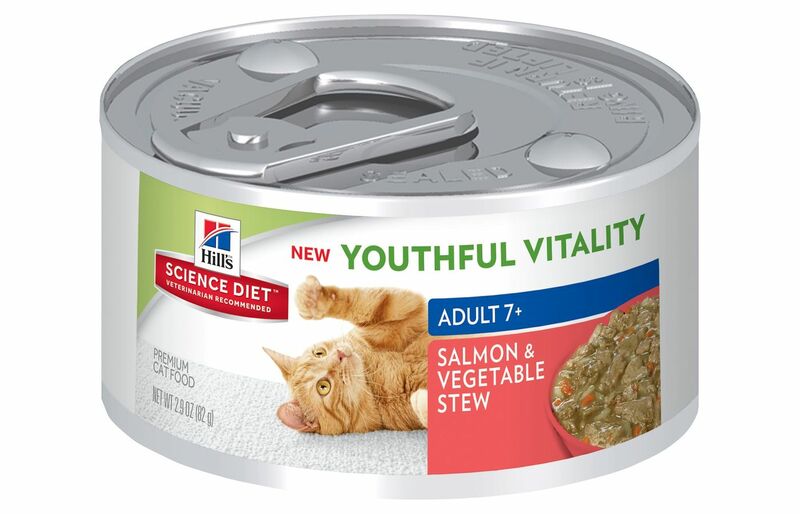 Youthful Vitality is a very appropriate name for this wet cat food. After all, you want your cats to enjoy life and stay lively even into their senior years. It is delicious and will also please even the fussiest cat. It is suitable for cats from seven years old and will suit older cats as well. This is because it is a stew and stews are easier to digest and to eat. By the time cats reach middle age, they do start getting tooth problems and large chunks of food aren’t appropriate. In addition, this wet cat food is jam-packed full of nutrients to keep your cats healthy and happy. It contains the essential fatty acids, omega 3 and 6. They help your cats to retain a luxurious coat which is shiny and sleek. There are also minerals in this cat food which are good for the bladder and kidneys. Kidney problems can be a common illness with senior cats so it is a good idea to try to prevent them from occurring. This dry food is one of the best out there. It is called holistic because it offers balanced nutrition with no additives or fillers. The protein and fat in this cat food is of high quality, while there is a limited amount of carbohydrates. It is made from whole chicken, not chicken meal, whole chicken liver, lentils, non-GMO vegetables and fruits such as cranberries and sweet potatoes. None of the animals used were given antibiotics and they weren’t factory farmed. This dry cat food is grain free which is easier on the stomach, making it better to digest. It is lower in calories and fat than some foods out there. This does help your cats to keep the weight off, important now that they are more sedentary and their metabolism has slowed down. There is more fiber however which helps to give them lean body mass. Also in this food is Dreamcoat, which is a supplement that gives a sleek and shiny coat. Royal Canin pride themselves in creating a perfect balance of proteins, fats, and carbohydrates in their pet food. This wet cat food is packed full of nutrients which will ensure the health of your cats and hopefully extend their lifespan. It contains Omega-3 fatty acids which keep joints supple, and a controlled amount of phosphorus to support healthy aging and renal health. There is just a moderate amount of fat in this wet food to ensure that your cats don’t put on any weight. At 12+ they won’t do as much running about as when they were younger so they need fewer calories. 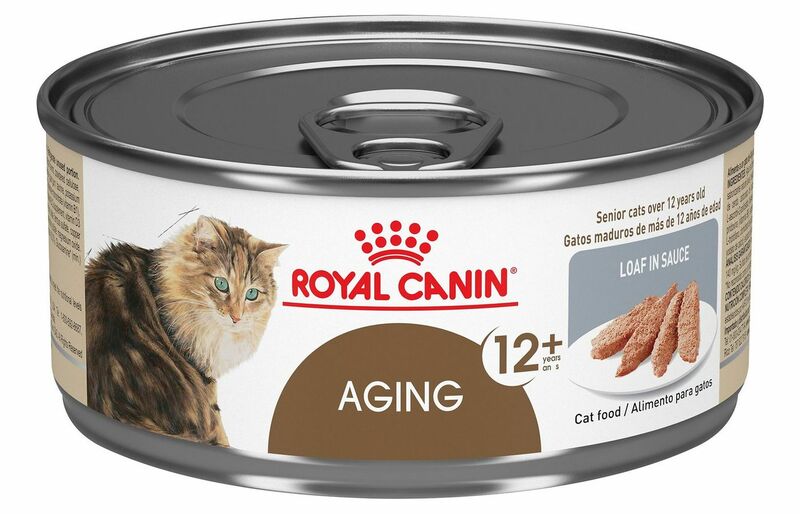 This wet food comes a loaf in a tasty sauce which is good for aging teeth. Your cats won’t have any trouble eating the soft loaf with the sauce and they will keep their teeth and gums in good condition. This wet food is the perfect complement to the Royal Canin Senior cat dry food. 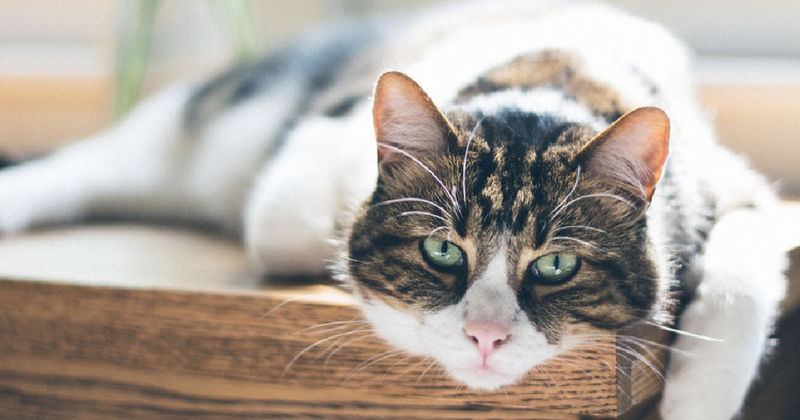 Seven years might not seem that old for your cats, but they are well into middle age and it is time to think about changing their diet so that they live their lives in optimal health. You want to give them the correct balance of proteins, fats, and carbohydrates for their age. This dry cat food has 38 grams of protein in each cup which ensures that your cats get enough meat to satisfy them. Cats cannot live without meat or fish as they are carnivores and can become very ill without these protein sources. 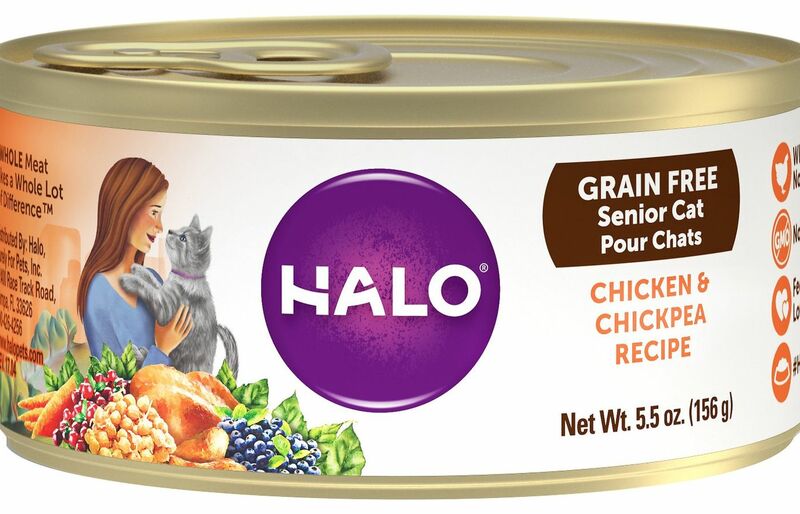 This dry cat food’s main ingredient is chicken and there are no unnecessary fillers. In fact, the food is grain free as cats don’t need to have corn, wheat, or soy. This high level of protein helps to support strong muscles and is good for heart health. The kibble is crunchy and this helps to reduce plaque build-up and it also helps to whiten teeth. If you are interested in supplying your senior cats with a holistic diet you won’t go far wrong in choosing this product. It is made from high-quality deboned chicken which hasn’t been factory farmed. There are no fillers, just healthy vegetables, and you can rest assured that your senior cats are getting the correct balance of protein, fat, and carbohydrate to lead a healthy life. This dry food has Lifestyle Bits which contain 7 antioxidants, as well as vitamins and minerals. They are produced with the minimum amount of heat so that the nutrients aren’t destroyed in cooking. This all helps to give your cats a healthy immune system. 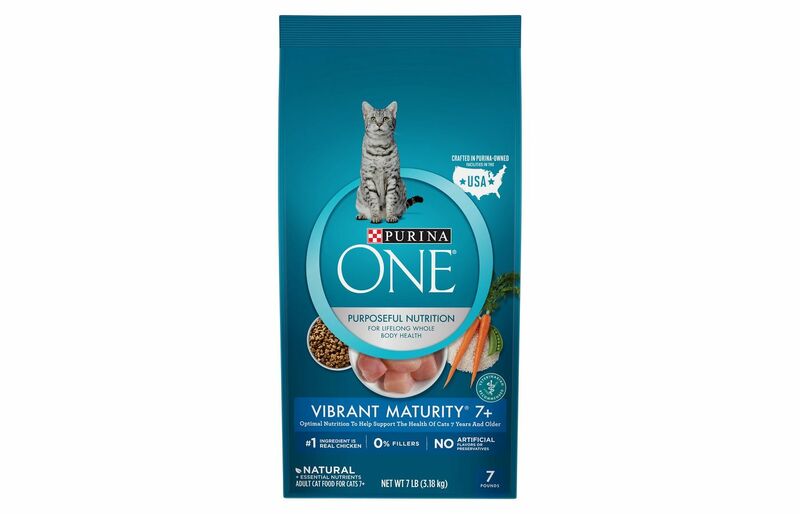 For heart and eye health, there is taurine, which is an amino acid, and for a luxurious coat and healthy skin, this dry food contains Omega-3 and 6 fatty acids. After feeding your cats this food for a while, you will notice the difference in their appearance. 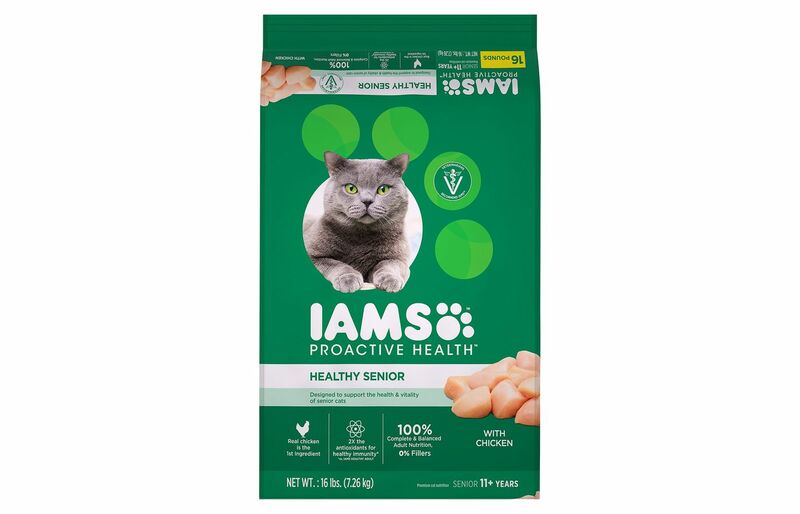 You want your cats to feel vital and healthy and Iams senior dry food does exactly that. For a start, it contains twice the antioxidants that many other cat foods have. Antioxidants, which clear free radicals out of the bloodstream, limit the signs of aging and will give your cats a healthy immune system. This dry food is jam-packed full of essential nutrients, vitamins, and minerals. Vitamin E is present which protects cells from damage, gives your cats healthy skin, preserves their eyesight, and helps to restore the immune system. 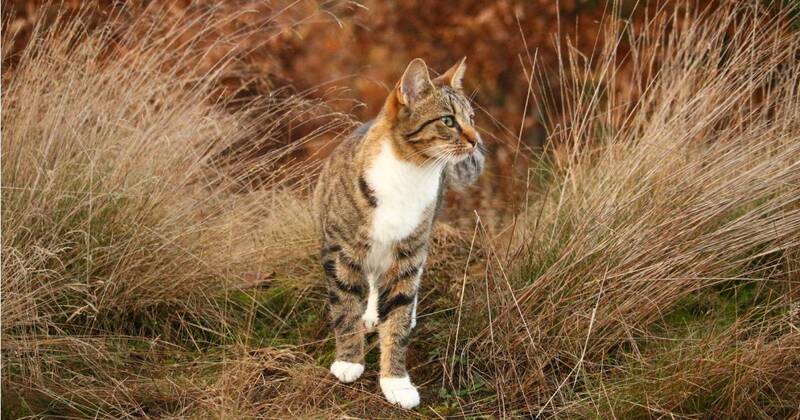 There is also calcium which helps your cats to keep strong bones and healthy joints. Together with potassium, calcium helps encourages a healthy heart. This dry food contains a unique fiber blend, which has probiotics and beet pulp and is excellent for the digestive health of your cats. Real chicken is used in this product and there are no fillers like unnecessary grains such as wheat, corn or soy. Why Should I Feed My Cat Senior Cat Food? As your cats age, their nutritional requirements change. They need to eat a high protein diet with plenty of vitamins, minerals, and antioxidants. However, the protein does need to be easily digestible and poultry and fish fit the bill completely. A good senior cat food, like the ones we have featured here, provides concentrated high quality protein with real fish and meat and no grains. Beef protein or other red meats are usually too heavy for your senior cats to digest. 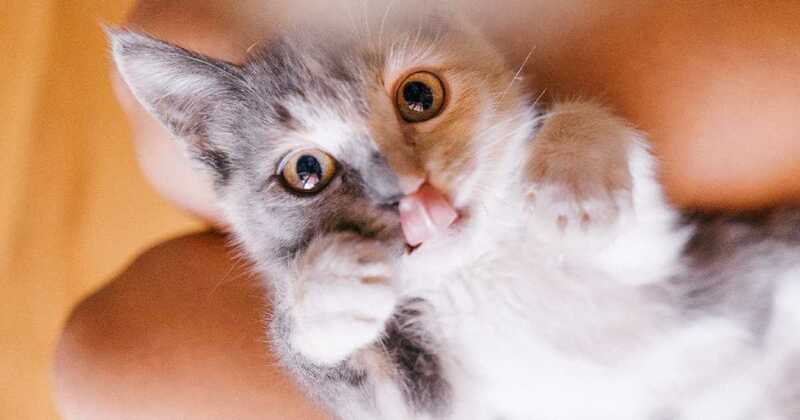 As your cats age, they start to lose their sense of smell and taste, as well as their ability to chew. Wet senior cat foods often come as the form of a stew which is easily digested or a loaf which is also easy to eat. You have to remember that your senior cats might have lost a few teeth by this time. The higher protein content of senior cat food can improve the smell and the taste of the food. Why Should Senior Cats Have so Much Protein? It seems contradictory to give senior cats more protein than younger cats. After all, senior cats are more sedentary and don’t rush about playing all the time. However, they need this extra protein to stop a loss in their lean body mass and muscle wastage which even happens in humans as they age. In addition senior cats metabolize protein less efficiently so they need more protein for it to reach the desired effect. The best source of protein is from animals and fish. Grain based proteins, such as soya, wheat, and corn, are not recommended as they are not high-quality as are animal sources. What Do I Do If My Senior Cat Won’t Eat His Senior Food? The first thing to do if your cats won’t eat their senior cat food is to go and see the vet. There might be an underlying problem like kidney or liver disease for which there are special treatments and special foods. If illness is ruled out, there are a number of measures you can take. Warm the wet food or moistened dry cat food in the microwave. This will increase the aroma of the food and might encourage your cats to eat. It is also a good idea to feed your cats smaller amounts of food a few times a day. By doing this, they won’t be so overwhelmed by the amount of food put in front of them. 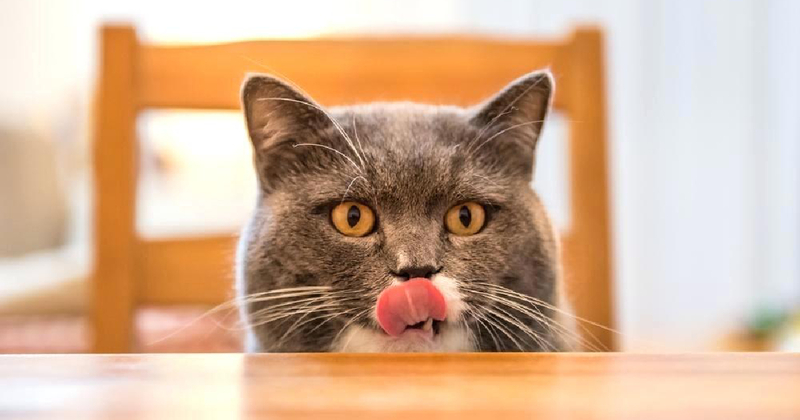 Ensure that your cats are in a stress-free environment when they eat. Make sure that any younger cats you may have aren’t bothering them. As a last resort, ask your vet about short-term appetite stimulants. It may seem that there is a minefield of information out there, but in reality it’s not that difficult to feed your senior cat. The first thing to do is to research senior cat foods and see which one has the right amount of protein, fat, and carbohydrates in it. Then monitor your cat. Make sure that they are eating what they are given. If not, see if the problems are elsewhere, like dental issues or lack of smell. In this article we have given you the remedies to help sort out these problems and we hope they will be useful. If you follow our guidelines, you should have a happy and healthy senior cat who will live out a long life. Cats start to show signs of aging when they are as young as seven years. The process begins slowly and you probably won’t notice it happening at first. However there are indications that your cats are getting a little older. For example, they will sleep more than play, they may lose control over their bladders, and they can get a little confused about where they are. You have to make adjustments as your cats age and one of these is changing their diet. Think about humans; you don’t give baby food to adults and vice-versa, so the same goes with senior cats. They need a special diet which fits their nutritional needs. Most important is that they get enough protein which will help them to live a long and healthy life. The best way to introduce senior cat food is to bring it in gradually. Mix a little with their current food and gradually increase it until all they are eating is the senior cat food. It can take up to 14 days, but it is worth the effort. Difficulty in digesting food is often a problem with senior cats. This means that both dry food and wet food need to contain less rich proteins. Poultry and fish are ideal. They also need fiber in the form of oats, brown rice, and barley. Steer clear of grains such as corn and wheat as they are fillers and don’t offer good nutritional benefits. It is advisable to purchase premium cat food for your senior cats. 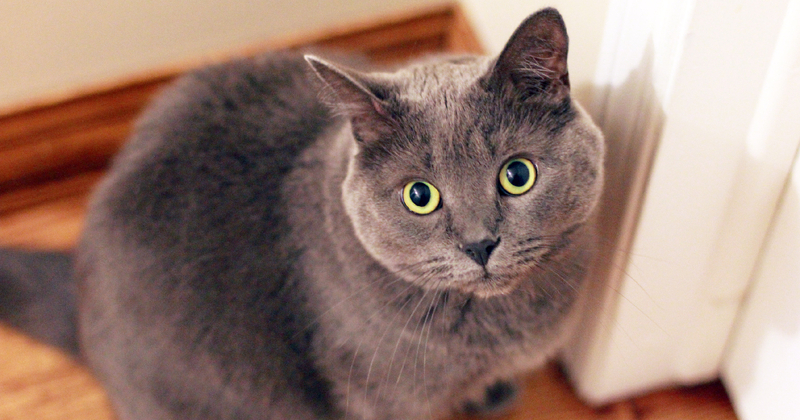 Store-bought discount cat food does not provide the best nutrients for them. It may cost a little more, but you will want the best for your cats.